About a year ago, my mom introduced me to a Greek potato recipe she’d discovered through Pinterest. I was immediately drawn to them when I learned the ‘secret ingredient’ was yellow mustard. After sampling the potatoes at a family dinner, I concurred with my mom that they were indeed the most delicious Greek potatoes we had ever tasted! Kudos to recipe developers Mirella and Panos of Little Cooking Tips! Since then, I’ve made the potatoes over a dozen times. Lately, I’m averaging once a week thanks to pregnancy cravings….they hit the SPOT. Over time, my mom and I have tweaked the method, which we feel improves the end result significantly. 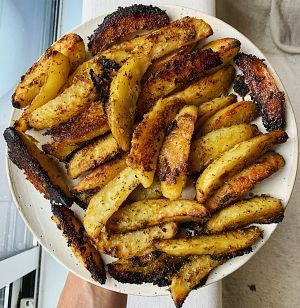 The main changes are a significantly crispier potato and a more flavourful one thanks to a quick par-boil and greater quantities of certain ingredients. I’ve shared the instructions on Instagram stories a few times, but I felt it was time to put these details on the blog so they are easily accessible to you. So, here you go: the best lemony Greek potatoes. I highly recommend you double the recipe. When you eat the last one, you WILL wish you had more! Just make sure you have two large casserole dishes (you don’t want to load up a single dish with double the potatoes or they won’t get as crispy). The day before you plan to enjoy the potatoes, get started with your prep. You want lots of time for them to marinate! Start by boiling a big pot of water on the stove and peeling your potatoes. Quarter the potatoes length-wise. If some potatoes are extra thick, you may want to cut each quarter in half. Once your water is boiling, add in 1 tsp of salt and 1 tsp of baking soda, then add in your potatoes and cover with a lid. Immediately, set the timer for two minutes. The cool potatoes will stop the water from boiling, but that’s okay — they are still cooking and getting softer. Once the timer goes, dump the potatoes out into a sieve and rinse with cold water to stop them from cooking further. You don’t want them too soft. Set them aside while you prepare the marinade. In your large casserole dish (anywhere around 11″ x 9″), mix together olive oil, minced garlic, yellow mustard (like Suzie’s or French’s), lemon juice, oregano, salt and pepper. Add in your potatoes and stir them around until each is fully coated. Cover and place in the fridge overnight. When you have the opportunity, remove them from the fridge and stir the potatoes around so the other sides get to bathe in the marinade (I try to do this at least three times before cooking). You can get away with a very short marinade (1 hour) but I’ve marinated up to 36 hours and they were amazing! I could tell the difference. When it’s time to cook them, preheat your oven to 390F and cover the dish with an upside down baking sheet (aluminum foil is typically used here but I find a baking sheet works just as well and it’s zero waste). Bake for an hour, then remove the cover and bake for another 45 minutes. Thanks to the baking soda in the boiling water, the bottoms should have an irresistible extra crispy layer. Remove from oven and enjoy with a Greek salad (with this tofu feta)…or all on their own like I do (I actually love them best at room temperature). Sometimes I add an extra drizzle of lemon when they’re on my plate. They’re all I want to eat sometimes!! Hope you love them as much as I do. 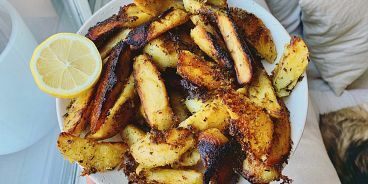 This recipe has been adapted from Little Cooking Tips’ “Traditional Greek Lemon Garlic Roasted Potatoes” recipe — check it out here!